Civil registration on P.E.I. began in 1906. Before this time, the primary sources of birth and marriage, as well as for death information were church records. 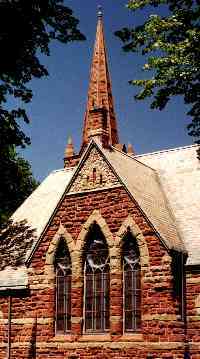 Many church records have been microfilmed, and their records are in the holdings of the Prince Edward Island Public Archives and Public Record Office (PARO). The following listing, while old, is a very useful tool for referencing available church records. It was compiled from the assessioning lists of PARO by Orlo Jones in 1986, and published first in the PEIGS Newsletter, April, 1987. Used with permission. As I hear of new acquisitions by PARO, I will update this listing.If you discover a record I do not have on this listing, please let me know at dhunter@islandregister.com. Church Locations and Phone Numbers - 0n P.E.I. P.E.I. Records in the holdings of the Family History Centrestm of the Mormon Church. P.E.I. Newspaper Holdings - in Canadian Repositories. Return to Services & Guides Index!